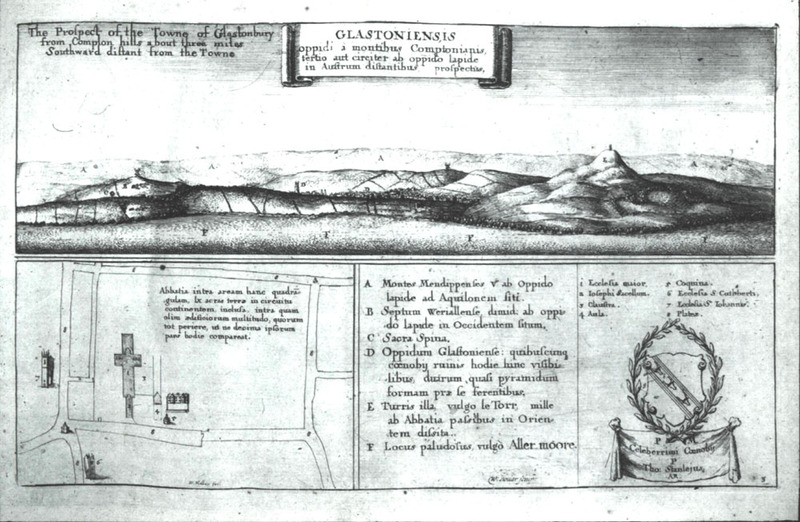 Wenceslaus Hollar was born in Prague in 1607 and died in London in 1677. He was an outstanding etcher, illustrator and draughtsman (particularly of topographical views) active in Germany, Flanders and for 32 years of his life in England. In the 1650s he was working for the antiquary and herald Sir William Dugdale whose Monasticon Anglicanum has numerous plates by Hollar. 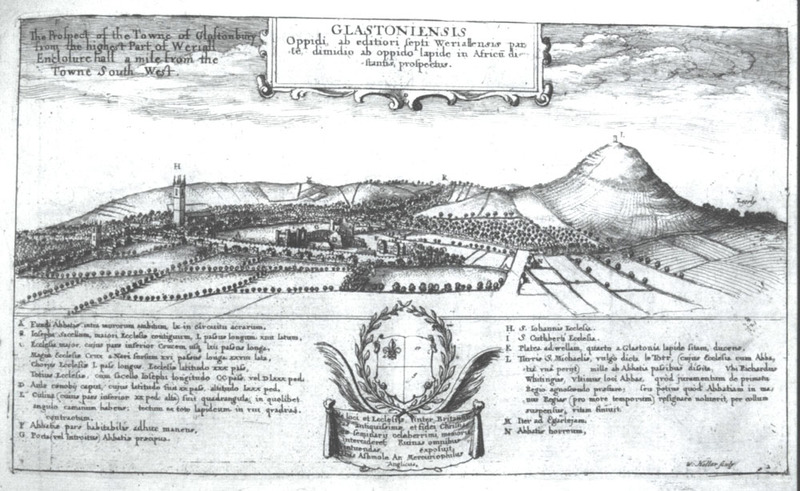 However, the two of Glastonbury and the Abbey, although engraved by Hollar, were drawn by Richard Newcourt, Gentleman of Somerton, who later became a prolific topographical artist (noted for his view of London before the fire). One view is from the top of Wearyall Hill, the other from approximately the present position of the Hood Monument. The Abbey is enclosed within this quadrangular area which extends for 60 acres; within which was once a multitude of buildings, of which so much has perished that not a tenth of them remains today. 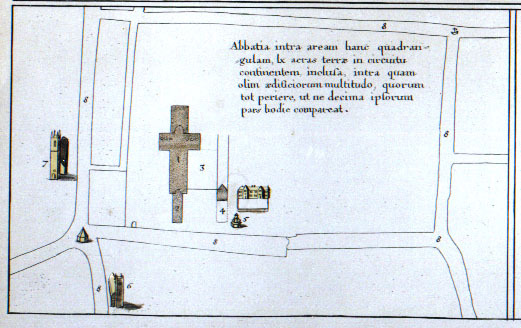 The plan, with east at the top, shows the abbots palace east of the kitchen (demolished c1710); the medieval market cross (demolished c1808); the site of the chaingate in Magdalene Street and a sketch of what may be a cross or conduit at the junction of Bere Lane and Chilkwell Street. A The Mendip Hills, situated five miles to the north of the town stone. D The town of Glastonbury with whatever ruins of the monastery are visible there today looking like two pyramids. E That tower which is commonly known as Le Torr, situated at a distance of one mile to the east of the abbey. F A marshy place, commonly known as Aller moor. 1 The main church. 5 The kitchen. 2 Joseph's chapel. 6 The church of St Cuthbert (Benedict). 3 The cloisters. 7 The church of St John. 4 The hall. 8 The streets. A The foundation of the abbey, enclosed within walls, extending for 60 acres. B Joseph's chapel adjoining the main church, 50 paces long, 14 wide. D The top of the hall of the monastery, 20 paces wide, 80 feet high. E The kitchen (of which the lower part is 20 feet high) is quadrangular; having a fire place in each corner; the roof, entirely of stone, rises into eight sections. F The domestic part of the abbey still remaining. H The church of St John. I The church of St Cuthbert (Benedict). K The road to Wells, a quarter of a mile from the Glastonbury stone. L The tower of Saint Michael, commonly called Le Torr (whose church together with the abbey has perished) situated at a distance of one mile from the abbey; where Richard Whiting, the last abbot of that place, finished his life hanged by the neck because he refused to take the oath recognising the royal supremacy, or rather because he would not surrender the abbey into the king's hands (according to the custom of the time). M The road to Egarley. In the foreground Bere Lane leads towards the Tor. To the left are Fishers Hill, Park Lane (later Street Road) and Magdalene Street which is built up on the side opposite the high crenellated abbey wall. Chilkwell Street is built up from the Tor to the High Street and the other medieval roads, Bove Town, High Street, Benedict Street and Northload Street all have built up frontages. The abbey, little more than 100 years after its dissolution, is shown almost as ruinous as today except for the Tudor abbot's palace (F), more of the medieval abbot's hall (D) and the south west tower of St Joseph's Chapel (later rebuilt). Hollar may also be indicating part of the chapter house and south transept. Many of the field boundaries are shown as they survive today. The Tor Common is shown divided into its medieval strips, a few of which survive as small fields. The lynchets, or agricultural platforms, are shown on the Tor and above the c19th cemetery site. A windmill is shown on St Edmunds Hill, later called Windmill Hill.